Public health chiefs fear an outbreak of tuberculosis among the city’s burgeoning homeless population , it has emerged. In an update to councillors the city’s public health director says a ‘significant’ threat exists of a TB epidemic among rough sleepers, due to their low levels of health and the conditions in which they live. According to the report by David Regan, there have so far only been a handful of cases among Manchester’s homeless, but the Victorian disease could be poised for a bigger comeback. “There has been a particular TB problem in this population group in London over recent years,” it says. 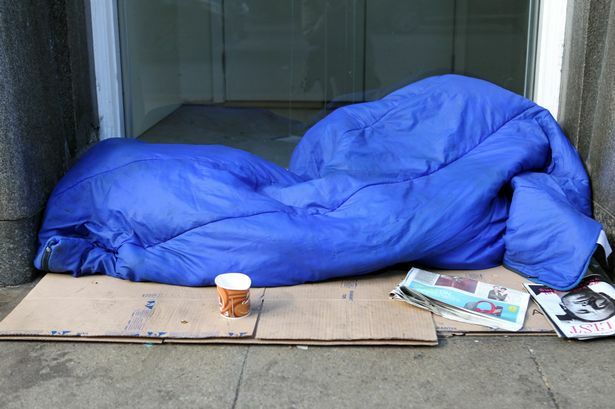 Manchester’s rough sleeping numbers have soared ten-fold since 2010, according to official estimates. There are likely to be far more than are identified during the city’s official count, however. The council admits it can be hard to treat TB among rough sleepers because the disease needs a six-month course of medication – and the homeless are by their nature transient. It also notes that partial treatment can lead patients to develop a strain of the respiratory disease that is drug-resistant. Amanda Croome, who runs the Booth Centre drop-in in Strangeways, said the charity had been working with health officials to deal with the cases seen so far. “It’s quite a live issue,” she said. “TB is most likely to spread among people living in poverty, people who are malnourished living together closely in bad conditions with poor ventilation. The council says it is working proactively to deal with the cases identified so far. Coun Paul Andrews, Manchester council’s executive member for adult health and well-being, said: “It is well known that people living on the street, as well as being exposed to many other dangers, are far more susceptible to illness and infection. “Living on the street is never a situation which enables people to live healthy, stable lives, and that is why our main priority is to get people off the streets and into temporary accommodation so a full assessment of their needs can be made and they can be put in touch with they services require – which includes linking them with health, mental health and professionals who deal with drug and alcohol issues – before we can work with them to enable them to rebuild their lives.